As the PM of the offshore teams I had that situation numerous times. We tried to become really agile, but our PO were far away and could not support us as much as we wanted. Sometimes the problem can have the deeper reason – PO does not have skills to write good user stories. In addition to being far away it can kill the project. Our solution was to bring the additional role to the project – Analyst. BA is part of the team, PO is left aside too. However this new/old person takes lead from team perspective in helping PO and shaping user stories. Great! But wait, we don’t have that additional person in our team! If you are working in the same companies I worked for – there is no additional people and BAs prepared to take this role. So we start thinking, how this role can be shared in the team. QA. The person who is very disciplined, knows everything about the application. Don’t forget, he is the one who created all that user cases documentation 🙂 The problem here is that QA may not have the proper mindset for that role. Their focus is completely different. As BA, tester should have a solid domain knowledge and vision of the product. Business needs should become a focus for him. It is important to have a holistic picture in mind while thinking over the user stories. 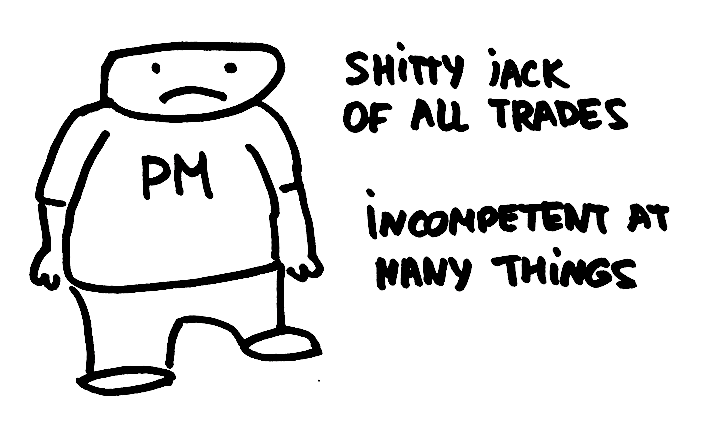 PM (who the hell is PM in agile team?). A great person to take the BA role, as he might have the vision of the product and be closer to the business needs understanding. There is more chances to find the needed skills in PM human being. On the other hand PM is the person you is responsible to make the project profitable for the offshore team. If he can change hats and be pro-client and pro-company in the different times or balance – great. Otherwise it won’t work. We tried the both options and I can state that the “PM option” was more successful. It means adding some work to PM, this person can’t now be “Look, how I can manage 10 project simultaneously!”. It is the new level of involving for PM. But, I guess, it won’t be a surprise for the PMs in outsourse business, as we are usually Jasks of all trades. But be aware to share too many roles. In one of the projects I tried to be the proxy-PO (BA), Scrum master and who knows what else… It was very hard and not good for the project. It is very difficult to find a QA, whose mindset is not limited to finding bugs. I am not saying, that they are not smart enough. Their focus is very hard to be moved. But I succeeded with one on me project and she became a real BA person. After that I tried to spread the practice. I am not giving up with the idea to have QAs with the BA skills! Guys, what do you think about this additional role in distributed teams, where we have so many issues connected to the communication gaps, insufficient information and unavailability of the product owner. That sounds pretty interesting. However, I believe there still are some “but’s”. QA’s are usually pretty busy with their own routine and how do you think will one react if you impose this sort of additional duties on him? Do you have any luck finding such a QA? Hi. Thank you for the comment. There are usually a lot of “but”s, it all depends a lot on people. Of course, you are not just adding that on top of the 100% loaded QA – he needs time to do such tasks. So you need to hire one more QA to your team)). I worked with at least 3 QAs who played such role in the project, one of them became Scrum master later. If you want highly motivated team – hire self-motivated people, it is much cheaper than motivating the “dead from inside” zombies. Empower people – and they will create their own rules and flows. If people avoid responsibility – fire them. But only if this matches your vision. I don’t call you to fire everyone tomorrow)) Hire only people who share your vision. it is the only way. Start with developing vision -> find right people -> it will work out, 100% 🙂 If you just go to QAs and say them that they have new responsibilities from now – it won’t work.